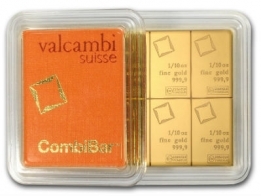 Valcambi combi gold bars are available in 1 ounce and 50 gram sizes. The Combibar features a number of smaller sized gold bars that can be broken off. These bars are availble for Swiss storage or delivery.